Tip toeing around a chilly morning kitchen isn’t my idea of a good time. Weekday mornings are an in and out affair. I put the espresso pot on the stove and quickly stir up some oats and jump into the shower. When I come back, the kitchen has warmed up considerably and I can start my day. But endless days of porridge can be a bit of a drag and yesterday morning I decided to put a little something special into a mid-week breakfast. I looked back to a couple of earlier breakfast recipes (cornmeal pancakes and orange ricotta pancakes) and decided to do a little mash-up. Instead of pancakes, I was going to combine the best elements of both recipes and whip up some waffles. And what waffles they were! As soon as our waffle machine beeped letting us know the first waffle was ready, we tore it apart and ate it on the spot. 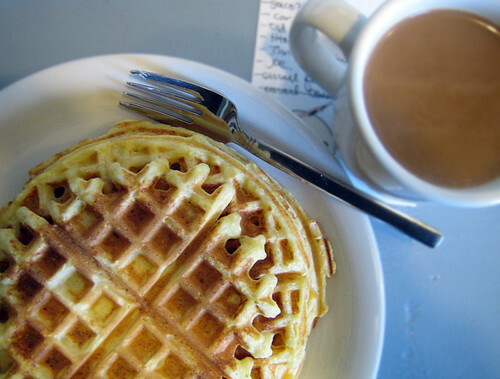 No syrup, no plate, no cutlery…just pure waffle loveliness. Crunchy from the cornmeal and so airy and floaty with the ricotta, they took the chill out of a cold morning kitchen. With these in my belly, I say bring it on, Wednesday, I can take what you got! Oh, and I’ll be in Bellingham, Washington on Friday and Saturday…so if anyone has any food tips, please let me know! Perfect things to buy at Trader Joe’s?? Gimme the scoop! Mix up the dry ingredients in a medium sized bowl. In another bowl, combine the wet ingredients. Add the dry ingredients to the wet mixture and whisk until smooth. Prepare waffles the usual way. Awesome – the waffle-maker dings to let you know that they are ready??? Wow!! Oh how i wish I had a waffle maker…just for that waffle smell to waft throughout the house. It’s been ages since i have eaten waffles and those waffles were the ‘Eggo’ kind so actually I’m a waffle rookie. If I owned a waffle maker…The first batch of waffles I would make with my new waffle maker would be chocolate chip waffles. Chocolate makes everything extra special. Then I might try making a savoury waffle with chives and salty things…perhaps even drop a poached egg top with some Hollandaise sauce…mmmmm! Now look at me…I’m obsessed with waffles. I know what you mean about becoming bored with oatmeal every morning. I’ve started adding cocoa to my oatmeal now for a different flavour. 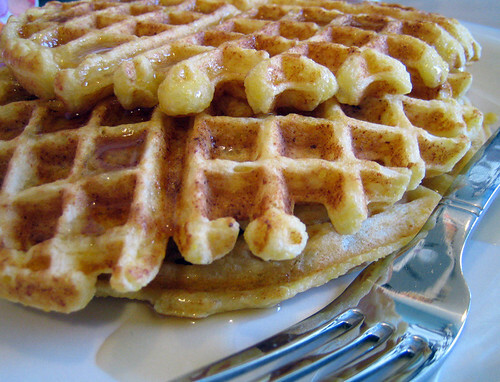 Waffles made with cornmeal must have added that extra crunchiness that I love so much -yum! I’ve never been to Trader Joes, but I’ve seen the candycane oreo’s and they look amazing!!! You should buy them and post them!! If you like check out my blog too. I’m trying to get into the groove of posting regularly. De-lurking to say that I know nothing about buying food in Bellingham, but it’s a good place to buy a car! Although we live in Whitehorse (yes, in the Yukon) my husband happens to be down in Bellingham at this very moment, picking up a used Volvo that is 3 years newer than what we could’ve bought for the same price in Canada. I also got him to pick up some quinoa for me, since it’s pretty darned expensive here, and I’ve only found it at the health food store. Sorry for being so off topic, but I’ve been enjoying your blog for a couple of months. With a toddler in the house, there isn’t always time for food adventures, though I once loved to cook. I absolutely LOVE your lentil salad recipe, and I’m planning to make it for a potluck next week. And just this morning I tried out the pan fried oatmeal – dang it was good. I’m dying to try to orange yogurt, too, but my husband keeps going out of town and I don’t think I could eat it all by myself. But I’ve taken to adding pecans and coconut and raisins to my regular yogurt, and oh what a lovely change! My, that was long, wasn’t it? Oh yum. They look great. I miss waffles. I’ve been enjoying your blog for a month or so, I found you off of “How About Orange”‘s blog. I love how well you photograph your food…..it makes it look so yummy! I tried your peanut butter raisin bar recipe and it was delicious! Thank you! So for Trader Joe’s……yes….you HAVE to get the Candy Cane Joe Joe’s….they are the best ever….in fact I was trying to figure out how I could get a good picture of one or of the box and do an ode to the Joe on my blog….I just love them. 🙂 Have fun! Bellingham! This city is the love of my life. You should make sure you go to a lovely little coffeehouse called The Black Drop. It’s on the corner of Champion and Grand. Also check out Three Trees for their coffee, their recycled cups and almost entirely volunteer based staff. They are on W. Holly. Avenue Bread and Deli has some of the best sandwiches I’ve ever had. There is both one on Railroad in downtown Bellingham, as well as one in Fairhaven (can’t remember street name now) and though they both serve the same things, I’d opt for the Fairhaven location. Be ready to wait for a while to get your food, but it’ll be worth it. Also check out La Vie en Rose bakery down on Holly. Amazing pastries. For good pub food and great local beer, hit up Boundary Bay Brewery and Bistro on Railroad. For wonderfully bizarre flavored ice cream, go to Mallards, also on Railroad. I’ve never been but I hear Le Chat Noir has a great atmosphere and crepe selection. It’s in Fairhaven on Harris, in the Sycamore Square Building. Service is apparently only so so. If you’re around for a Saturday, head to their Farmers Market on Railroad and Chestnut. Fairhaven also hosts one on Wednesday on their village green. AND (this is it, I swear!) if you have time to see a movie, the Pickford Theater is an adorable cinema that plays great indie flicks. It’s on Cornwall. P.S. Haven’t been back to Bellingham since their Trader Joes opened, but you can never go wrong there! These would definitely make my mornings a lot better! I am too fearful of a waffle machine to purchase one, but these look lovely! My fiance’ and I swear by Trader Joe’s Chocolate-Covered Peanut Butter-filled pretzels. (He said, and I quote, “This is the end of food. It can’t get any better than this.” But of course, he has a wicked sweet tooth.) In fact, I plan on sending some of those back up with him when he returns to Quebec on Sunday. Your waffles look like the perfect breakfast. They make such a nice change from the regular breakfast routine. Plus they’re extra good at holding syrup. Trader Joe’s – take your time browsing through each aisle. You never know what wonders you’ll find there. It’s a good place for butter, yogurt, chocolate, tea, cheeses….hmmm, I could go on and on. Love Trader Joe’s! joanne, i’m curious about adding cocoa to oatmeal…i have a friend who does the exact same thing! must try. whaling station, i’m definitley buying some of those candy cane oreos! monique, seeing tj’s from your balcony? wow, that is dangerous. and i’ve recently found the shutterbean blog too, so thanks for the link! fawn, thanks for de-lurking! glad you like my blog and are making up some recipes from it! it’s funny because i’ve been wanting to visit the yukon for a couple of years now! one day soon!! thanks michelle for the nice words! okay, i guess i’ll buy more than 1 box of the candy cane oreos! moni, i can feel your enthusiasm for the city in your comment. i love bellingham too. we often go to the boundary bay brewery and always make a stop at casa que pasa, but i like that you listed a ton of places i’ve never been to! the cinema sounds awesome and i’ll definitely check it out if we have time! haha, rachael, we got one as a wedding gift! kali, i love those peanut butter filled chocolate pretzels. yum! mmmm, waffles, i couldn’t agree more, lynn! thanks pancake queen, these waffles are tasty and unique. Ricotta waffles? I think that’s reason enough for me to get a waffle maker! Oh no, you’re there right now. I wish I read this post earlier. I am so obsessed with Trader Joe’s. We bought one of their insulated totes so next time we can buy frozen things. I have plantain chips and Kookaburra licorice on my list for next time. I read that their frozen pain au chocolat is good. Tell us what you got when you return! This is what I wanted to ask: do you know what foods we can’t bring back across the border? The internet is infuriatingly vague. I suspect dairy products. Made your chocolate thumbprint cookies with raspberry jam yesterday for my friend’s birthday. They’ve been a big hit so far, so I’m definitely doing it again! Thanks! An unexpected but delicious sounding combination! I could have used some today. Walked to work in the rain and the water wicked up my pants all the way to the knee. Quel bummer! Oh darn! Now I’m regretting not asking for that waffle iron for Christmas! lydia, tj’s was awesome but we got snowed out and came home early. boo!! as for forbidden foods…i know fruits and vegetables are out, but we did bring across sausage. i don’t know! hi tanvi! it’s been ages 🙂 i love stroop waffles…didn’t know tj’s made any! jinger, glad you loved the cookies! I JUST bought a waffle iron for Christmas and can’t wait for the family to unwrap it so I can make some waffles! !